I never really looked twice at the cart that has been set up for the past several months next to Kwik Meal on 45th & 6th avenue. As a loyal Kwik meal customer for several years and lover of their chicken pitas, I admit it never occurred to me to try whatever carts (and there have been a few over the years) that decided to try their luck nearby. 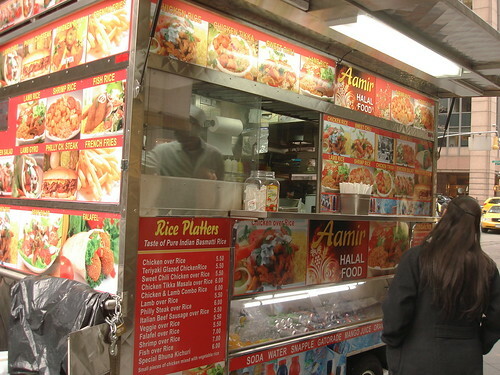 While walking on 45th street the other day, I finally took notice of the Aamir Halah Food cart (sister cart to the one on 46th street), because they were offering Thai sweet chili kati rolls. Yep, like Biryani Cart, they added Kati Rolls to the menu, and not only that, but they’re ripping off Biryani’s popular Chennai rolls. Posted by Rachel Goldner at 11:45 am, August 9th, 2012 under Aamir's Halal Food. Lunch’er Josh, aka NYC Foodie, tipped me off to a new cart called Aamir Halal Food- which is serving chicken tikka and lamb over rice on the opposite corner diagonally across the street from the Biryani Cart (on 46th and 6th). According to Josh, the new cart is run by Aamir Hussein- who just so happens to be the father-in-law of Meru, the owner/chef of the Biryani Cart. When I stopped by to ask Meru about it yesterday, he called the new cart “competition” and admitted that it was in fact his father-in-law running the cart, and serving very similar food. He stopped short of saying it was causing “a problem in his family” (my words, not his) but I could see he wasn’t too psyched about the whole situation. If I had to translate the look he gave me into words, I think it would be: “it is what it is”. Totally in the mood for some street meat (I’ve been on a street cart tear lately) I headed over to this new unauthorized copy of the Biryani cart to see what was going on. Posted by Zach Brooks at 11:45 am, April 16th, 2009 under 46th btw. 5+6th, Aamir's Halal Food, Biriyani Cart, Cart, Street Meat.